wow. this was something I’ve wanted to do for fifteen years. McCovey Cove Dave has always encouraged me to do it via twitter (@McCoveyCoveDave). I am so glad my son and I went – HIGHLY RECOMMENDED. The Giants took 2 of 3 from the Cubs on their visit to AT&T. 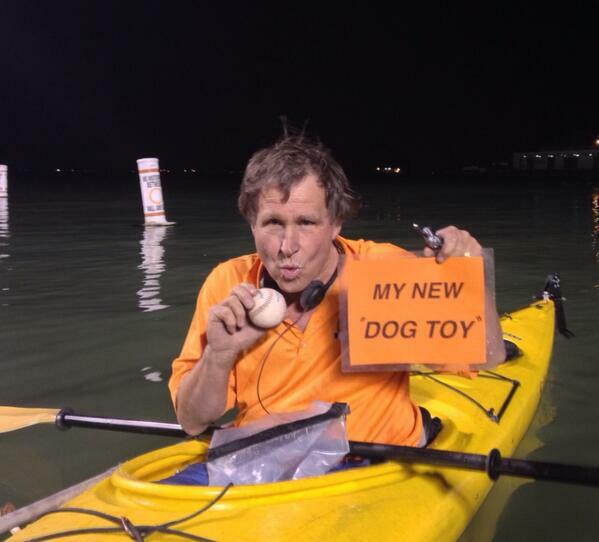 I didn’t get a chance to write about it because I was out fishing and KAYAKING MCCOVEY COVE! – woo hoo. I am posting a video of that as my next post, but wanted to add this as a placeholder. The Giants took the Cubs series 2-1 to continue their dominance of both leagues – best record in baseball and the most series wins in both leagues. Really looking good headed to St. Louis today for four against a tough National League opponent. The game has just been called due to the weather. Hail stones and rolling electrified thunderstorms suspended this one, tied 2-2 in the bottom of the sixth, with David Huff on the mound for the Giants, a runner on for the Rockies. The game will be resumed at that point during one of the first three days of September when the Giants visit Colorado again. whew! TWEET: Suspension of #Rockies #SFGiants series by hail and rain, has something poetic about it. Like two teams too equally matched to conclude. This has been a tense couple of days and the road trip ends, fittingly, without conclusion, suspended, in limbo and somehow still tense. This year the Rockies and Giants seem fated to do battle down to the wire. One wonders what the records will be like in that first week of September, in the home stretch of the season. Are these three and a half remaining innings going to be incredibly significant? And what about the idiotic way in which clowning around by the dugout and Santiago Casilla led to four weeks on the DL for Casilla and the Giants having to call up George Kontos? This was a weird week. Three HBP’s in game one, and after his retaliation plunking (for hitting Tulo) Bumgarner got into it verbally with the Rockies as he ran up the line. Romo getting tagged. Still, the Giants have to be happy with the trip. They got the Rockies to play by the Giants’ tempo. It still really feels like the Giants won both of these … just one hanging slider away from four up on the Rockies. Giants pitching tamed the hard hitting Rockies in their park, at altitude. The game plan was intact and the Giants had a shot at taking both and indeed all three of these games. Looking forward to the Giants coming home this weekend for some Inter-league ball – so we get to make fun of their pitchers swinging the bats – followed by a visit from our historic rivals, dating back to the 1800’s, everybody’s second favorite team (’cause they’re never a threat to anybody’s first) the Chicago Cubs. After beating the Marlins 4-1 Sunday the Giants flew directly to Denver and checked into their hotels so as to enjoy as much of their day off yesterday as possible. Ryan Vogelsong’s strong outing made the home stand a winning one and kept the Giants three ahead of Colorado in the NL West standings. The rest was much needed. The Giants are ready to get back to baseball tonight against the red hot Rockies who boast three of the top five best hitters for average in Justin Morneau, Charlie Blackmon and Troy Tulowitski. Tulo leads the league in average (.393) and Home Runs (13) and is third in RBIs. Tulowitski’s line is staggering: .494 OBS/.764 SLG/1.259 OPS and he leads in every category by a wide margin including Wins Against Replacement. His 4.5 (WAR) is way beyond. The Denver Post has a nice article about Tulo today. The Rockies have tasted first place in the NL West already this year and could tie for the lead with a sweep. They’ve been blasting the ball and have hit 62 homers as a team. They beat the Giants in Colorado on April 22 of this year on the strength of five homers and they smashed five in Cincy on the 10th to beat the Reds. The Rockies clubhouse was struck by a viral infection which sent Catcher Wilin Rosario to the DL, but he has been reactivated from the injury list. Madison Bumgarner pitches for the Giants tonight, followed by Matt Cain tomorrow night. Tim Hudson will likely be returning to the starting lineup for Thursday’s day game. Hudson missed his last start and was sent to the DL to rest a sore right hip, but has been throwing on flat ground since Saturday and will throw bullpen today. Angel Pagan is listed day-to-day for the series because of his left shoulder, which he sprained diving for a ball in the last Marlins game. Pablo Sandoval has begun hitting, stepping up in the absence of Brandon Belt. His solo homer yesterday was nice to see. His nine game hitting streak could include more long balls in the altitude of Coors Field. Let’s hope so. After the come-from-behind victory in game one, the Giants were forced into another come-from-behind situation in game two, when Yusmeiro Petit was burned by Marlins bats for four runs in the first four frames. In fact, the very first batter Petit faced, Christian Yelich, ripped a line drive home run. The day already felt long. But Petit evoked three consecutive fly balls for outs and looked for the most part, together. In the bottom of the first, Pablo Sandoval not only extended his hitting streak to 7 games, but added an RBI, doubling in Pagan to tie the score, 1-1. But the Marlins bats went to work on Petit after that, culminating in the four-run 4th that chased him from the game. To their credit the Giants clawed their way back and tied this one 5-5, But Santiago Casilla imploded in the top of the ninth allowing the Marlins to knock in two more for what would be the final score, 7-5, Marlins. Miami got 14 hits and seven runs in this one. Beat us up. What is it with their bats and our park? Man, I hope we don’t see them in the playoffs. After game two, the team, fans and broadcasters didn’t seem too concerned. After all, Petit was making an emergency start for the staff ace, Tim Hudson. He was chased, the Giants responded, and the bullpen was due, maybe even overdue, to blink, after weeks of successful shutdown work. So O.K. put it behind us, get a good night’s sleep and move on. But then came last night’s 5-0 shutout loss for Tim Lincecum … featuring Brandon Hicks missing first base on a one-out double that had advanced Sanchez to third. Reviewed. Out. … Ugh. Oh, and a missed tag at the plate by Hector Sanchez added to the Giants woes. Tim Lincecum had a quality start, went six and allowed just three runs, but the Giants couldn’t get anything going against the Marlins Tom Koehler. Rough outing. Now the brows start furrowing, as the home stand is at 3-3, with today’s game being the difference between tying or losing the series to these Marlins in our park, again – and winning or losing the home stand. Ryan Vogelsong goes for the Giants vs. Jacob Turner. Luckily Turner’s not great (0-1, 6.75ERA). But the bigger question is whether we can play sharp ball and defend against the Marlins bats that love AT&T Park. In some ways the Atlanta Braves mirror the Giants – great pitching, good defense and “just enough runs” come to mind. Looking at Andrelton Simmons and Crawford side-by-side does, too. Or how about the pitching staff … for example in today’s game when it’ll be Bumgarner versus Teheran – dominant big pitchers. So when the Giants went into Atlanta and swept the Braves last week, it wasn’t so much a surprise as the first move in a chess match that could easily end in the National League Championship series playing for the pennant. In the first game of this week’s series at AT&T Park on Monday, Tim Lincecum turned back the clock and turned in a glittering performance: the FreaKKKKKKKKKKK – yup that’s 11 strikeouts. 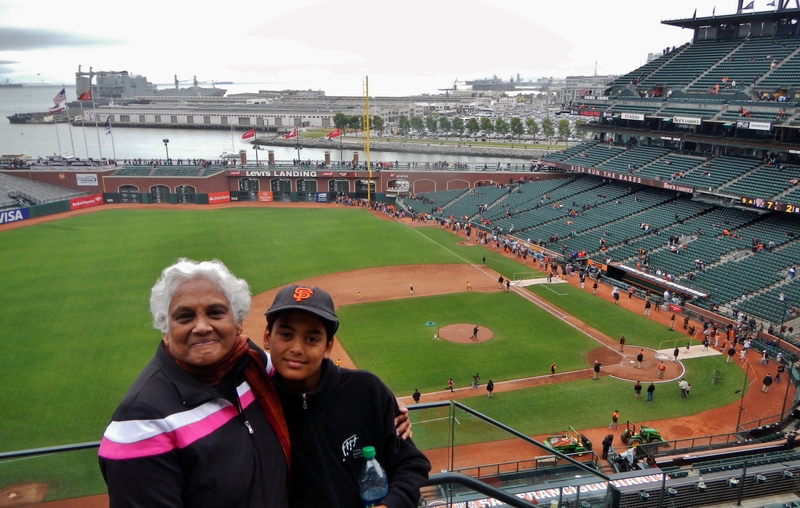 Timmy was backed up by an equally exciting performance at the plate – by Tyler Colvin – who smashed a splash hit into McCovey Cove in his first at-bat as a Giant. Colvin followed that stellar drive with a bases-clearing triple that drove in three and gave the Giants a 4-1 lead. Wow, what a debut! Romo got the save, but not before giving up another run to the Braves. In fact Romo’s been pretty shaky the last couple of outings – including giving up a game-tying HR for a blown save in LA. Hey Romo, Maybe worry less about your new shoes and more about keeping your eyes on the prize: 50 saves … you said that was your goal two years ago, Sergio. Make it happen, cap’n. Then of course, the Giants went to sleep in game two, and couldn’t plate a single run for Ryan Vogelsong. The Braves’ powerful lefty Mike Minor mowed down the staff and earned Atlanta’s first win over the Giants this year. Vogey fell to (1-2), despite a decent five innings. It all fell apart in the 6th. The critical error in this one was that Buster Posey missed a tag at the plate, that he should have easily made. The 6th inning unraveled after the play and the game was lost. It’s going to be over 90 degrees at the park today as the two aces take the mound. Julio Teheran has only been beaten once since April – but that was by the Giants – and Madison Bumgarner seems to have righted his course and is back to his winning ways. Will the warm weather knock one or both of these guys out? Or will it be a lock-down nail biter? Stay tuned – it’s Giants and Braves at battle once again. Now that was a great road trip. On what was meant to be the Giants longest and most difficult road trip of the season – ten consecutive nights facing the NL East-leading Atlanta Braves, the Pirates in Pittsburgh and four vs. the Dodgers in LA, the Giants emerged with a 7-3 record and showed flexibility, poise and power. They swept the Braves in Atlanta for the first time since 1988, using power – a parade of home runs – and pitching. They lost two of three in Pittsburgh, but the one game they took was a wild one that went 13 innings and in which 21 runs were scored. Bizarrely, after being unable to score with RISP in Atlanta, the Giants flipped the script and won that one with situational hitting; moving runners over with bunts and sacs, getting timely hits with RISP. It ended with Jean Machi’s bunt RBI and not a single homer. Despite losing Brandon Belt to a broken thumb and having Sergio Romo blow a save in the ninth in LA, the team managed to chip away and fight for wins to stay on top of the NL West by two games over Colorado and four and a half over LA. Back at the friendly confines of AT&T this week, it doesn’t get much easier, as the top two teams of the NL East are in town. The Braves are certain to have vengeance on their minds after the Giants swept them last week in their park. Then next up, it’s the Miami Marlins, a surprisingly good team this year, just two back of the Braves out East. After the homestand, it’s back on the road to face the Rockies in Colorado – who will be looking to seize the division lead. It’s going to be a tough stretch the rest of May. Tim Lincecum is on the mound tonight. He will face the Braves’ Gavin Floyd. Game One of this series was one of the craziest games ever witnessed. 13 innings of scoring and hits which end on an RBI bunt by the winning pitcher Jean Machi. I can’t even get into it here, but it was an epic win. Giants 11, Pirates 10 in 13. That crazy game was, sadly, followed by two losses in which the Giants bats went back to sleep. The Game Two loss was due to instant replay review allowing a game-winning run to score when the play was called out at the plate. Giants lose 1-2 on the first ever replay walkoff. The Game Three loss was a Tim Lincecum debacle in which he gave up 4 and we weren’t able to score more than 3. Belt did hit a homer though to continue the Brandon Belt Parade O’ Homers around the major league ballparks of the United States and Canada. He has hit a home run in every ball park the Giants have played in this year. Now it’s off to Los Angeles to do battle with the nemesis, with the division-lead on the line. Vogey is up first facing Beckett, so don’t get your hopes up. We’ll see if the back-to-form Vogelsong is for real, I suppose. Sure would be nice to get some of those home runs going again. Today the Giants have landed in Pittsburgh, PA. Yesterday, the team announced they are giving the Big Horse, SP Matt Cain, an extra start off to allow the small cut on his finger to completely heal and that today in his place against the Pirates Yusmeiro Petit will get the start. The Giants website mistakenly had Jake Austin Dunning, starting. So there was some confusion. But @hankschulman and @knbrmurph both confirmed this a.m. that it will in fact be Petit. Yusmeiro Petit’s been killing it and it’s good to go with the guy who’s hot right now and to let Cain’s finger fully mend. Schulman’s piece is crisp and clarifying on all that has gone on. Since the team put Cain on the DL, they had space for Dunning, a tall (6’4″), 26-year-old, right hander who pitched twice for the Giants last year. He was 0-2, but had 2.84 ERA. So Jake Dunning has been called up for long relief, for example in the instance of a Lincecum or Vogey implosion. Dunning will not be facing Jeff Locke, who in a weird twist of fate, is in fact, making his season debut after coming off of injury. He is 11-13 as a Brave and left rookie status in 2012. Which makes me feel like we are going to light this 23-year-old young man up! I like this one a LOT, especially against a young guy, just back from injury, like Locke. I expect the Giants to score a lot of runs in this one. Pablo should be able to jump on this kid and hopefully snap the slump. In Game Two, the Giants held the Braves to just one run on the strength of pitching under pressure by Ryan Vogelsong, home runs by Michael Morse, Brandon Belt and Buster Posey and good defense – in particular once again by Brandon Crawford – who made a 270 degree spin and threw out his counterpart Andrelton Simmons to end the game. Giants win 3-1. Vogelsong had a good game. Vogey went six innings and had as many strikeouts. He was stable and pitched particularly well under pressure. He gave up five hits, four walks and a run. 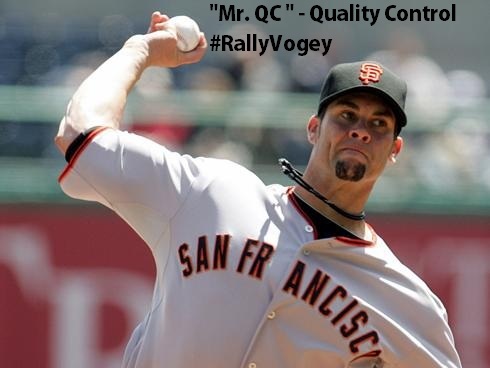 He looked in command, much like the Vogelsong of old – I hope he has turned the corner. Brandon Belt has now homered in every single baseball park he has played in this year. Michael Morse continues to impress. The three homers were against the Braves’ ace Julio Teheran – a good sign. But once again the runs were all solo shots. So the five runs in two games that have won this series have all come from homers with no one on base. Today Madison Bumgarner takes the mound in the state he was born and raised in, where he grew up cheering the Braves. He will likely have a lot of friends and family in the stands. Good. Because Madison has not been pitching well. He looked utterly befuddled in his last start and was touched up for it. He has lost three straight starts. Bumgarner faces Alex Wood, whose 2.93 ERA helps the Braves have the lowest team ERA in the league, but he has endured four straight losses. One of these guys should break that streak today. Tim Hudson was incredible. He averaged only ten pitches an inning over eight innings during which he allowed one run amongst five hits. It was a stunning display of command over himself and control of an opponent’s lineup. Thus, in the top of the 9th, with a 3-1 lead, Hudson faced the possibility of averaging ten pitches or less in a complete game. With the pitch count so low, Bruce Bochy left him in. Hudson quickly sat down the first two batters of the 9th on six pitches. Then he had a two strike count on the Padres Yasmani Grandal when he sent an 87mph cutter down the gut that Grandal timed perfectly, connected on wholly and sent into McCovey Cove – a solo shot. Hudson’s 89th pitch ended his night, one out shy of a CG. I hope Mark’s dog rips that thing to shreds. Sergio Romo came in to get the one-out save, his seventh, and this one was in the books as another outstanding performance by the SP who must be considered the Giants’ ace of 2014 thus far, Tim Hudson. The Giants’ offense did score twice early. A Michael Morse double was plated by a Posey RBI in the first. Then in the second, The Giants made it 2-0 on a solo shot by the increasingly impressive Brandon Hicks. Hicks’ homer was hit right handed, inside-out to deep RF – only Bonds ever did that kind of stuff at AT&T. It blew minds. But afterward, the Giants struggled to support Hudson at the plate. Padres lefty Robbie Erlin settled down and he found a groove. Pitchers love our park and often play to our level of pitching competition. It’s an issue. It means we have to fight, scrap and hustle – with knowledge of our park they don’t have – to produce runs. The Giants had RISP on three occasions and blew them all. The worst was a leadoff triple by Brandon Crawford in the 4th, when he was left stranded by a clunky, sputtering Giant offense. But in the previous inning the Giants had Morse and Belt on 2nd and 3rd with two out and could do nothing. Luckily, Buster Posey singled in Arias (who had doubled in the 7th) to provide an insurance run that would prove to be necessary. Had Buster not hit that RBI late in the game, Grandal’s massive splash hit would’ve tied it up! The Padres’ bullpen is decent and will fight in extra innings to steal wins. We could have easily been involved in a dog fight again on a night when Tim Hudson was throwing like Greg Maddux. Point being, the Giants need to be more consistent about situational hitting with runners in scoring position. After Buster’s RBI single, with runners in the corners, Morse struck out, failing to get Pence home from third. ugh. Mark my words: whichever team – Dodgers, Giants or Colorado – plays smart, crisp baseball and hustles most for 50/50 games, will take the NL West. The SF Giants shot at being that team will depend on sacs, bunts, steals and hits with runners in scoring position. On the bright side, as May begins, the Giants (17-11) lead the division by one and a half games over the Dodgers. On the road for our first two weeks of this month we face the Braves, Pirates and Dodgers next. It’s time to tighten up the hitting in these batter-friendly parks and to continue hitting well against the nemesis in LA. I’d love to see us take 6 out of 9. Go Giants! After Cody Ross and Fontenot in 2010 and Scutaro and Theriot in 2012, this looks like a pattern: Morse and Hudson in 2014. Hmm. “World Series Champions 2014,” has a nice ring to it.